Slide Angle Friction is a measurement of a sheet like substrate such as paper, corrugated, plastic film or paperboard which determines the angle of inclination at which one substrate affixed to a sled will begin to slide/slip against another substrate of a similar material. During a test, an inclined plane is increased at a rate of 1.5 ± 0.5º per second by an electric motor until the test block begins to slide. 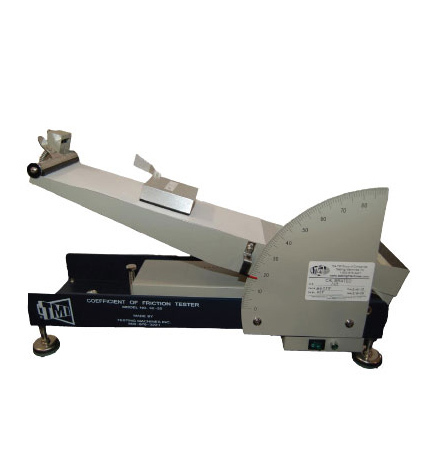 The initial movement of the sled is the Slide Angle or Coefficient of Static Friction of the material. When the test block just begins to slide a photo-optical sensor automatically stops the inclined plane and the operator can read the slide angle result. A variety of factors can affect the Slide Angle measurements including abrasion, coatings, varnishes, printing and most importantly humidity. Paper, plastic film, packaging films, paperboard, corrugated and other sheet like materials.